This set of circuit boards will make the Aleph J amplifier of Nelson Pass. This amplifier is a direct descendant of the legendary Pass Labs Aleph 3, the amplifier that turned the audio press upon it's ear, brought single-ended amps to many people, and catapulted Pass Labs into the forefront of specialist audio engineering and construction, where it still resides today. Populate these boards with your components, then add your own power supply, chassis and heat sinks to complete the amplifier. The Aleph J is a single-ended, Class-A, Mosfet power amplifier, with a Jfet driver stage. It utilizes the Nelson Pass 'Aleph Current Source' to greatly increase the overall efficiency of the output stage, with the benefits of more linearity, a higher damping factor, and greater stability into tough speaker loads, doing all this with less negative feedback than it's predecessors. The Aleph J is a regular kind of amp - a voltage source amplifier, requiring nothing out of the ordinary from the preamp or the speakers. As with most of the Firstwatt amplifiers the power output is 25WPC into 8 ohm. 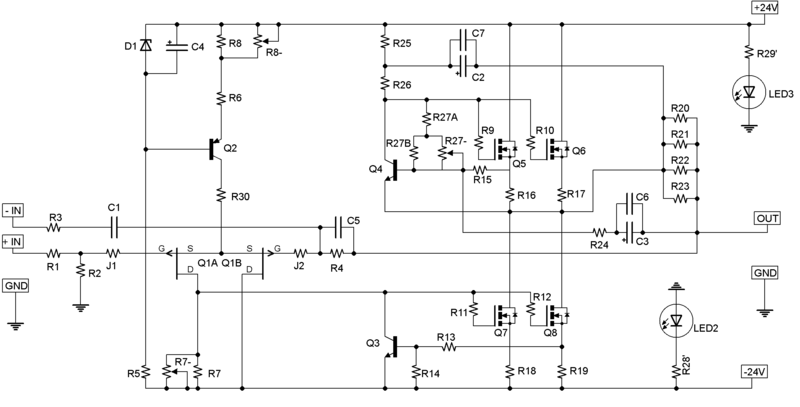 A Bipolar power supply of (+/- 24V) is required. This will require an 18V+18V (or 36V Center Tapped) transformer from 300-500VA, and PSU capacitance of 60,000uF per rail or more. A PSU for the F4, F5, or similar will be appropriate. See the build guide for details. The 4U 'Jack of all Chassis' is ideal for this amplifier. If making your own chassis a good rule of thumb is at least 25sq inch (160sq cm) of finned heatsink per output transistor. (More is always better.) The diyAudio "Universal Mounting Spec" (UMS) is a common mounting pattern between the amplifier PCB and the heatsinks. If you utilize the UMS on your heatsinks or use one of the pre-drilled chassis from diyAudio, you will be able to quickly and easily mount different amplifier boards in the same chassis. For example, a 4U 'Jack of all Chassis' with a 400VA, 18V+18V transformer and PSU board, will give you a power supply and chassis where you could try the F4, F5, F5C, Aleph J, and other Pass/Firstwatt amps in the future merely by swapping the amp PCB. The investment in Chassis and PSU needs only be made once. As always from diyaudiostore, another high quality product, delivered to the other side of the planet with absolutely no hassle whatsoever. cheers DAS.. They arrived fairly quickly, and seem well made. Great service. Quick shipping at a very reasonable price. With the contributions from forum members, such as the excellent build guides and advice offered by 6L6, I can't think why you would risk getting similar unknown products from other sources with little to no back up. Great boards for a great amplifier. Very well done diyAudio! Now it's time to collect all the components and start the build.